The holiday season is just around the corner and we're determined to make our tradition of sharing traditional recipes from around the world last for at least on more year. Previously, we've told you about quirky Scandinavian dish Lutefisk. Now it's time to taste your way around Iberian peninsula with our local favorites, Spanish tortilla and francesinha from Portugal. 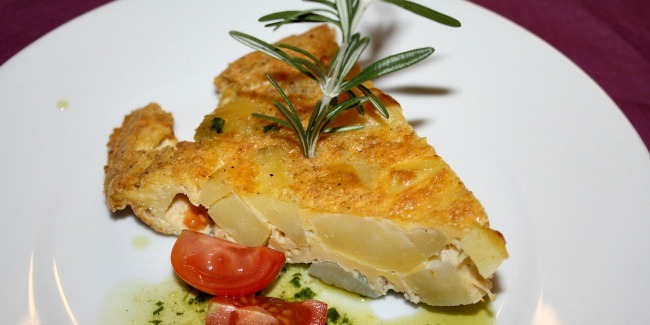 Spanish Tortilla de Patatas made with potatoes and scrambled eggs is a popular notorious dish served both as a sandwich or a tapas. The Tortilla Cake was invented by a Basque general Tomás de Zumalacárregui during the siege of Bilbao. The delicious cake has a simple recipe, is quick to make (about 30 minutes) and can be a great treat on every dinner table. Wash and peel the potatoes and onion, then slice them in thin sheets. Add salt and pepper. Pour plenty of olive oil in a deep frying pan and add the potatoes, onion (and other optional ingredients). Cook them on a medium heat fire and remove from the frying pan when they get slightly brown. Whisk the eggs in a bowl until you get a slight foam and the eggs are well blended. Add the potatoes and onions to the bowl and let them soak in the eggs for 10 minutes. Put two tablespoons of olive oil in a nonstick frying pan and spread it on the whole surface. Pour the mixture of the ingredients on the pan and cook it for 6-8 minutes until it starts to set. Place a large dish on top of the pan as a lid, with a quick movement invert the content of the pan into the plate, then slide the content back on the pan with the cooked side up. Your Spanish Tortilla Cake will be ready in 2-4 minutes and can be served both hot or cold. ¡Que aproveches! as the Spaniards would say, wishing you to enjoy your meal. Simple yet exquisite culinary delight, Francesinha sandwich was invented in Portugal in 1960s as an adaptation of French classics - boiled ham and cheese sandwich. However, over time it became intrinsically Portuguese delicacy closely associated with its birthplace, the town of Porto. Francesinha is a thick sandwich with ham, cheese, chorizo sausages, meat, and eggs served with french fries and covered with a secret beer sauce. Dissolve cornstarch into the milk and add all the ingredients. Blend the liquid mix on a food processor. Put it into a pan over low heat and add the bay leaves. Stir it until it starts to boil. Now the time is right to serve the sandwich on a plate and pour the boiling hot sauce over it (the cheese should melt, so the sauce has to be really hot). Voila, your francesinha is ready!